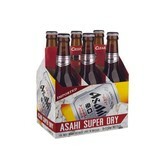 Order Asahi Super Dry Japanese Lager & Other Asian Beers Online! With its refreshing barley flavor and crisp aftertaste, Asahi Super Dry is by far the most popular high-quality beer in Japan. Since its debut in 1987 as Japan's first dry beer, it has continued to improve the taste and excitement of beer. Its taste has set a new standard that is acknowledged around the world today. Asahi Super Dry uses carefully selected strains of yeast that not only facilitate outstanding fermentation, but also enhance the beer’s sophisticated aroma and refreshingly dry taste. The malted barley used in brewing Asahi is selected from an exclusive network of grain suppliers around the world, based upon precisely detailed criteria. Such precision ensures uniform quality across the globe at any time of year. Hops of the highest quality give Asahi Super Dry an elegant touch of bitterness. Karakuchi means dry, and it is the word that best describes the sophisticated yet congenial character of Asahi. Its refreshingly crisp, clear taste makes it an excellent match for any cuisine.